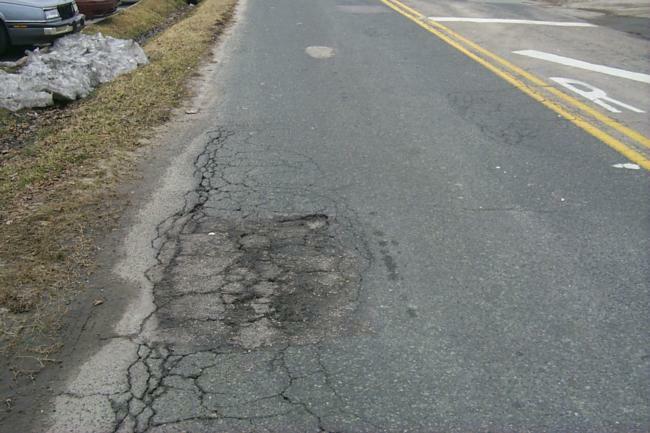 NCDOT is asking residents of Central North Carolina to report potholes for repair. State road crews are working to repair potholes that were caused by another icy winter. The North Carolina Department of Transportation is asking residents to report potholes so they can be repaired quickly. NCDOT spokesman Steve Abbott says potholes are bad for vehicles, threatening tires and alignment, and they make for dangerous driving conditions. Abbott says this is the second icy winter in a row, causing severe road damage. He says $14 million of last year's $22 million pothole expenses went to post-winter road repairs. Abbott says temporary cold-weather patches are going in now, and there will be permanent fixes when the weather warms up. Residents can report potholes online or by calling 1-877-368-4968. Abbott asks that spotters offer a cross street when reporting a pothole’s location. Communities across the country are trying to replenish their stores of road salt. But, after the past harsh winter, the price of rock salt is climbing drastically. Chris McGee is Raleigh's Transportation Field Services Manager. He says the city uses about 1,500 tons in a typical winter. But McGee said they used more than 4,000 tons this time around. Also, their cheaper purchasing contract just ended. Raleigh recently signed a three-year contract that is 25 percent more expensive than the last one. McGee said they're buying enough salt for a typical winter right now. Yellow Department of Transportation trucks have been used to disguise roving patrolmen. The North Carolina Highway Patrol used them for a pilot program in which troopers patrolled for people who illegally text while driving. Lieutenant Jeff Gordon says it's hard for roadside troopers to see whether motorists are texting, and people are quick to stop if they see a police cruiser.